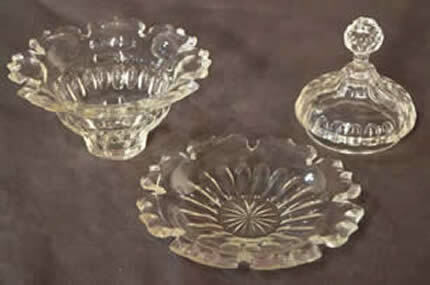 Rare to find, a three piece original cut glass Serving dish or bon bon offering lidded urn with its original saucer, bowl and cover. 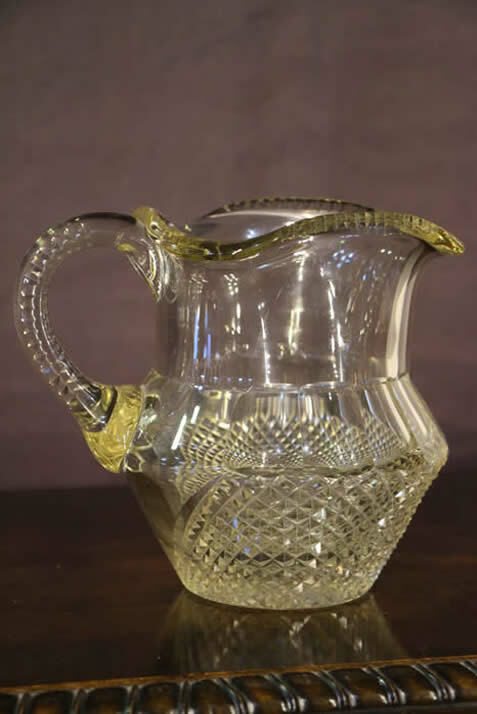 A rare Irish Georgian cut glass large jug or Pitcher with original cut glass handle , star cut base where the pntil mark would be and heavy pineapple cut lower waiste. 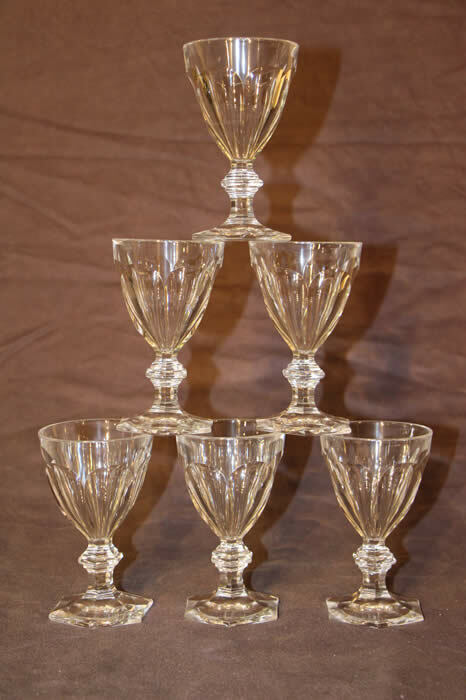 The facette cut middle border and moulded heavy rim top with cut ornamentation. very good condition and no chips or cracks. 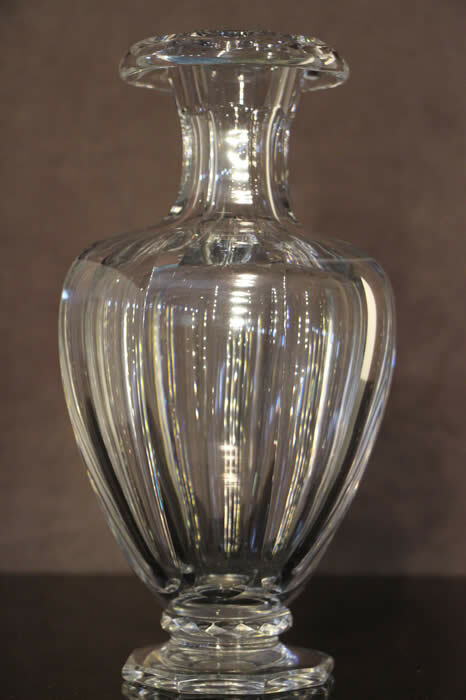 A substantial vintage heavy cut crystal vase of Art Deco influence and shape with solid hand blown base. In perfect order, no cracks or chips and and ivery heavy weight of 3.6kg. 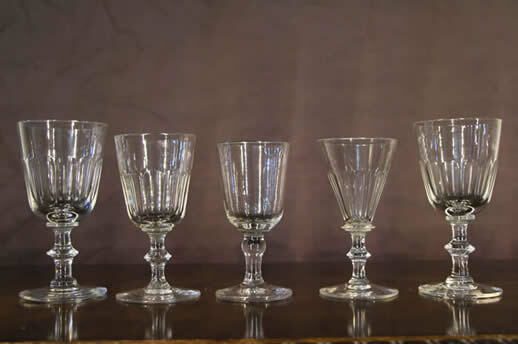 Rarely does such a large set of Georgian period wine glasses come on the market and this set is extensive and in superb condition. 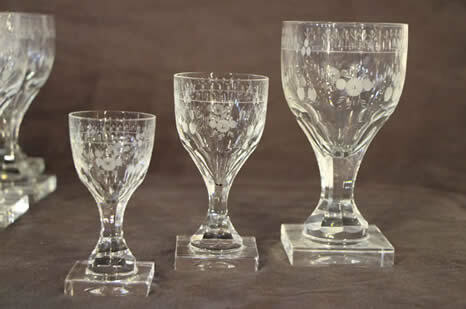 A very large set of 34 georgian engraved glasses in perfect condition. superb quality and very heavy weight. 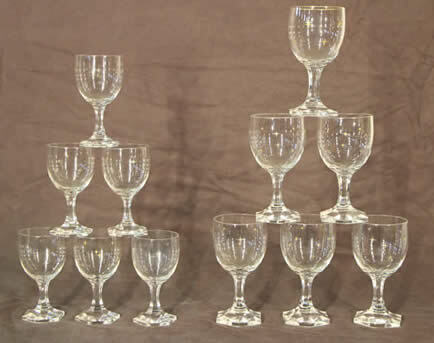 The set comprise 12 spirits or port glasses, 12 white wine glasses and 10 large red wine goblets. that's only $250 per glass! 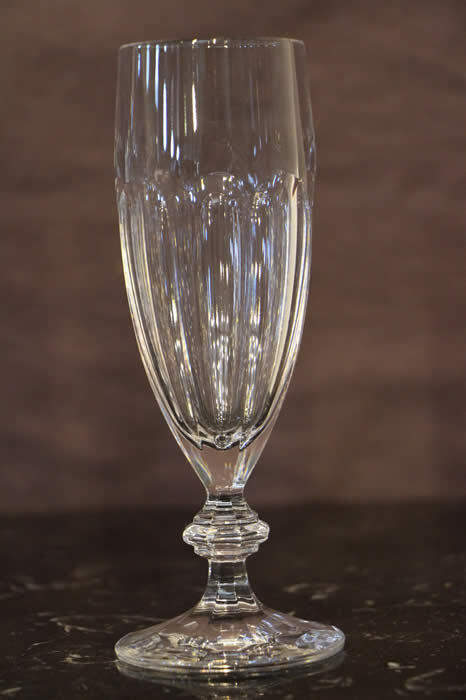 heavy cut crystal vase of Art Deco fan shape with solid hand blown base. In perfect order, no cracks or chips and of very heavy weight 1.3 kg. 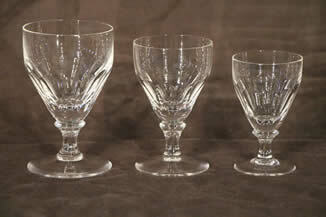 Beautiful set of six antique engraved large red wine glasses in the 18th century Gustavian manner probably by Kosta. 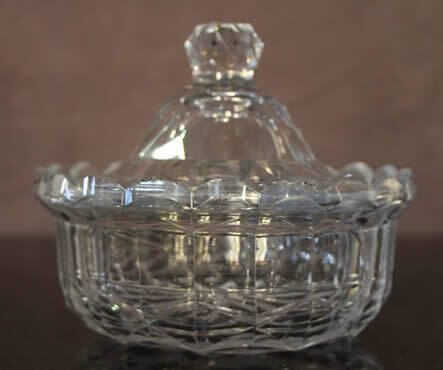 Elegant cut crystal bowl raised on flared stem and stepped square base. 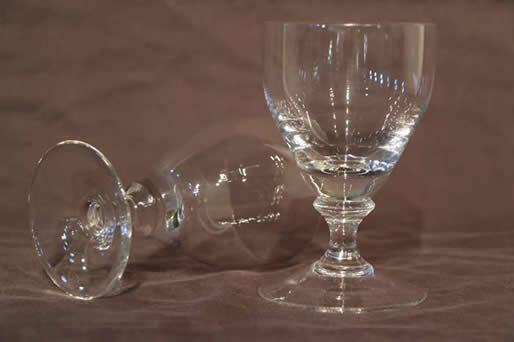 Slight height difference is due to hand blown and original ground bases. In excellent order. 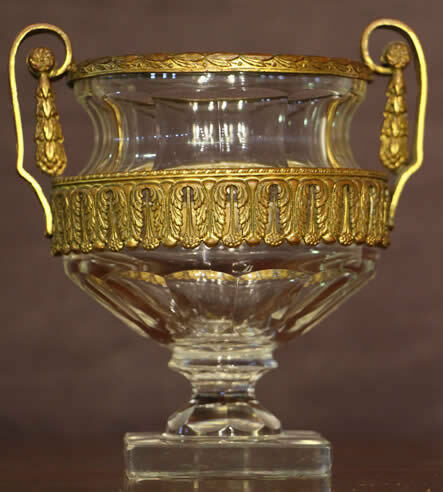 These are in the Georgian Rummer style with cut and facetted bowl and fine circular knobbed feet. This is the larger one in the image below. 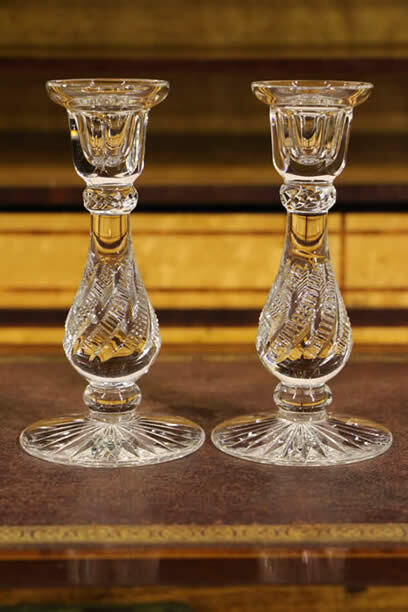 Set of two toasting goblets signed by William Yeoward in the IONA pattern. they are in perfect condition and are the middle size in the lower image. 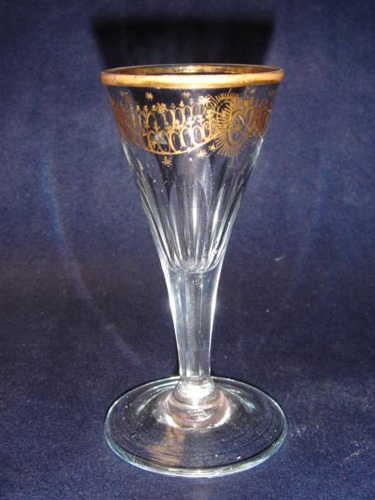 A signed by William Yeoward desert wine glass signed to base. 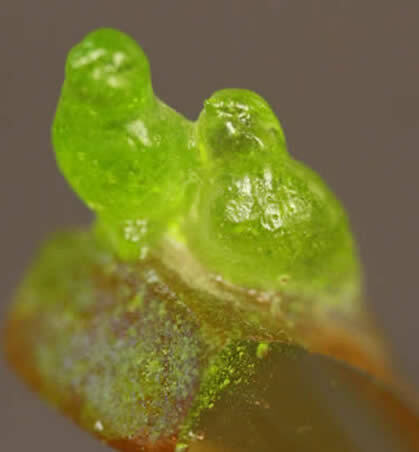 it is the smaller in the image below. 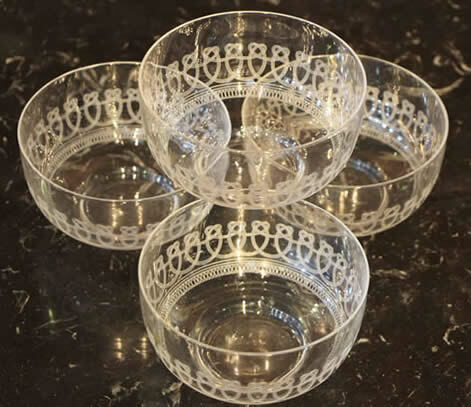 A set of five matching Pallmall design engraved Jelly bowls, used to serve delicate fruit jellies and triffle. All in excellent condition. 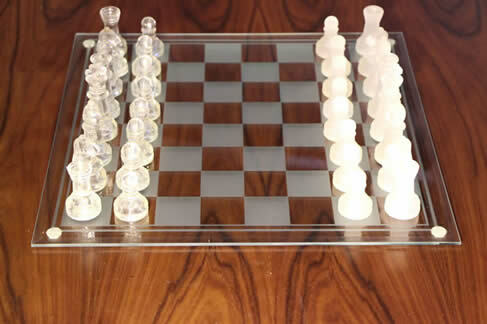 Unusual Art Deco style chess set with frosted glass and etched crystal chess board with bevel edge and supported on four (later) applied rubber feet. 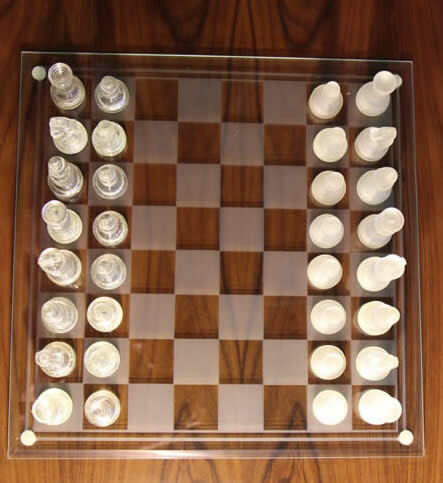 Large chess board at 35 x 35 cm . 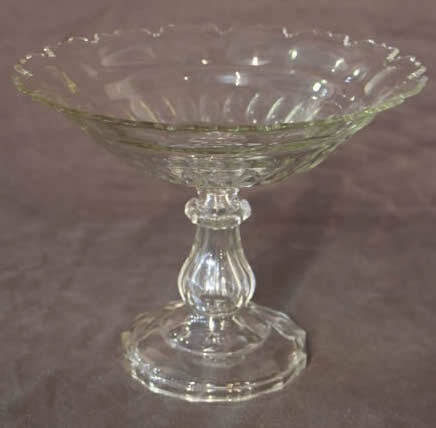 Very large Victorian cut glass comport with facetted cut and hollow blown base. Lovely detailed edge work. This set of three glasses signed engraved Riedel mark to base. 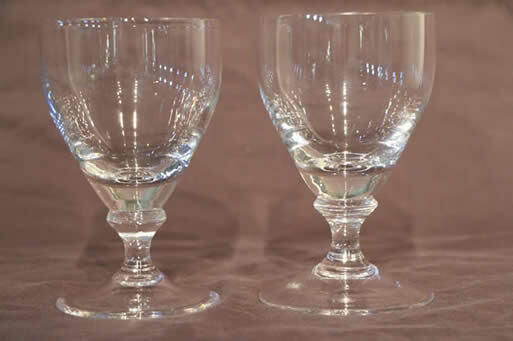 These large glasses were used at Loggerheads, the former home of Len Evans during his wine options, a most enjoyable but somewhat frustrating game for wine enthusiasts. Leonard Paul Evans AO OBE : 31 August 1930 – 17 August 2006. 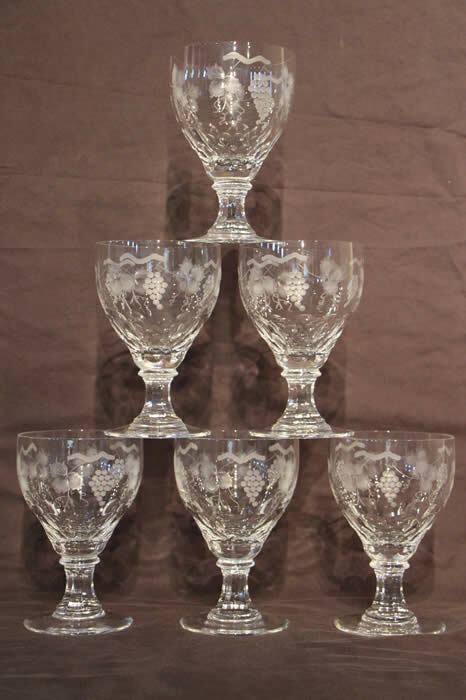 A rare set of 6 each, red and white wine goblets with elegant shaped bowls with star cut and gilt details. 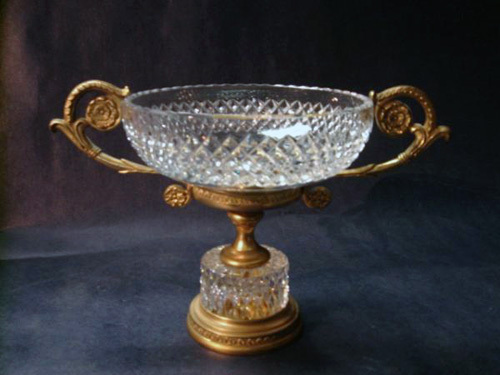 The gorgeous gilt edges shaped bowl raised on facette cut crystal stem and foot. 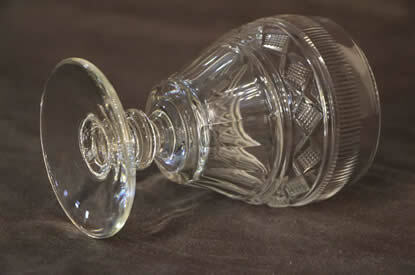 Georgian cut glass wine carafe decanter triple ring neck and cut facette to body and neck. Slight clouding to inner surface but will clear with any liquid contents . 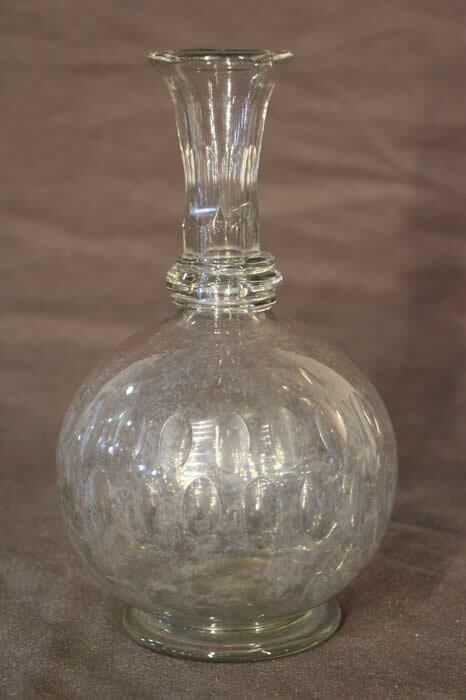 Rare 18th century wine carafe with cut glass neck and triple ring below. The bulbous gourd shaped body , hand blown resting on solid base. 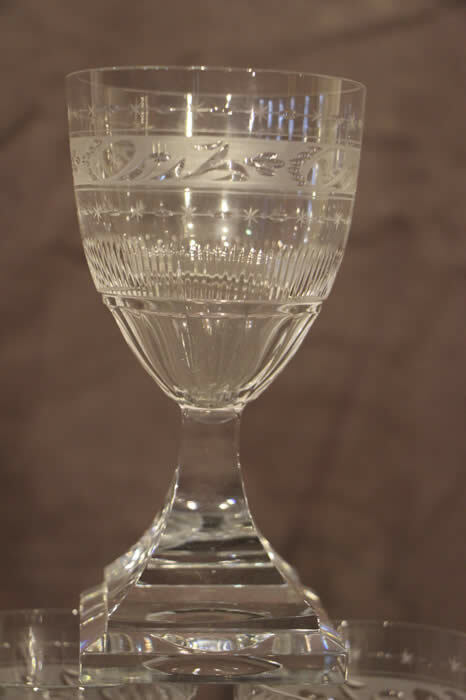 Huge Antique Georgian style cut glass goblet with bucket shaped bowl and facett cuts. Raised on knobbed stem and circular foot. 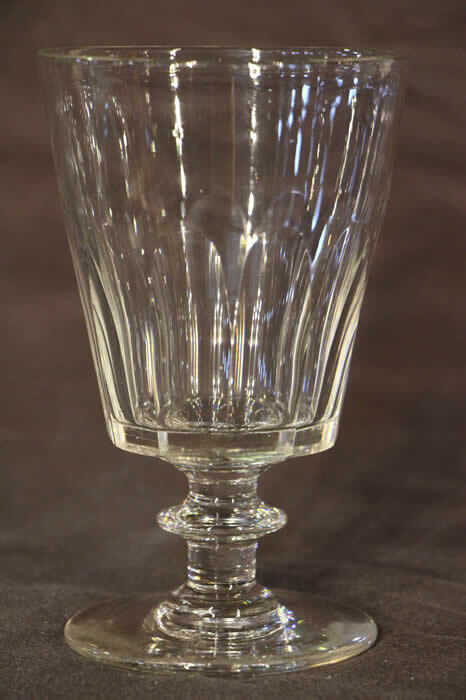 Large Georgian cut glass huge rummer with bucket shaped bowl with facette cuts and raised on turned knobbed base and circular hand blown foot. Set of 6 heavy Baccarat style cut crystal glasses, 20th century, priced as set of 6. Raised on very heavy and hand ground facetteted base. 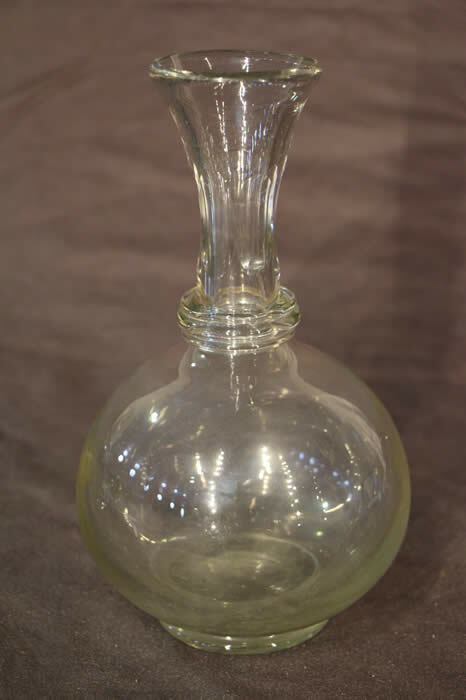 Antique French ribbed hot molded and cut wine carafe decanter with flared top and elegant cut facetted neck. 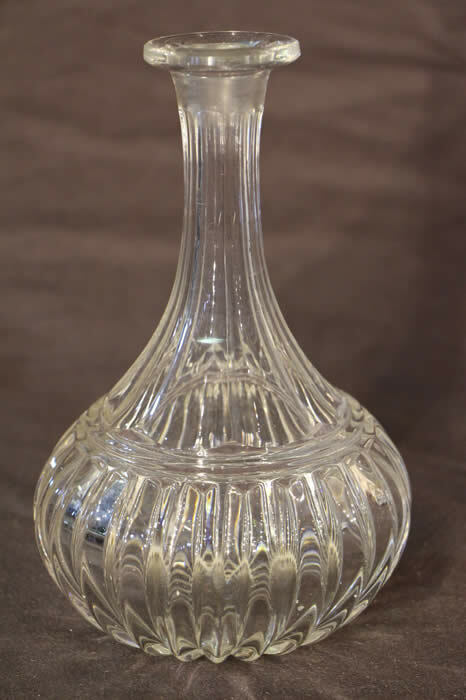 Decanters with such flared necks were never used with stoppers, as they were meant for serving and decanting of fine wine. 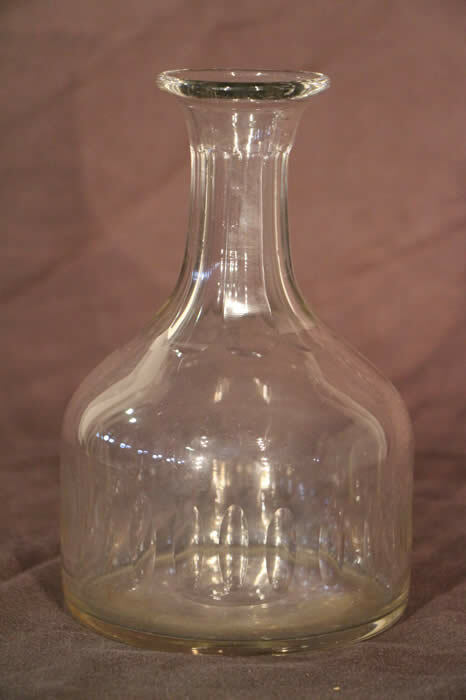 French tall neck decanter wine carafe with molded ribbed sides and cut facette neck to flared top . 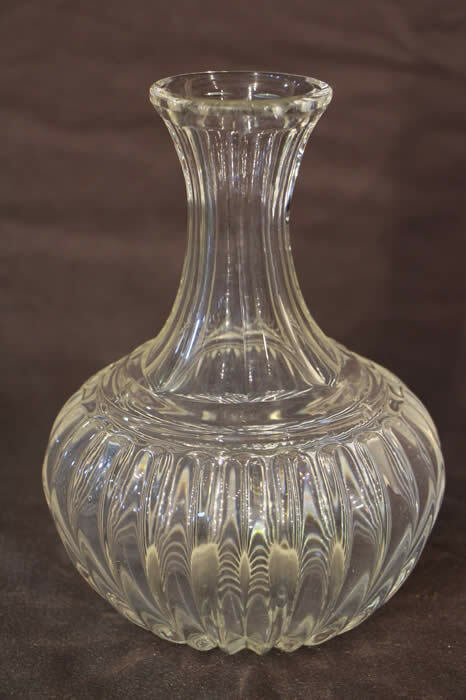 Georgian style cut crystal wine carafe decanter with flared neck, facette cut and lobbed edging. The bulbous body with slash cut and star cut to base where the pontil mark would be. 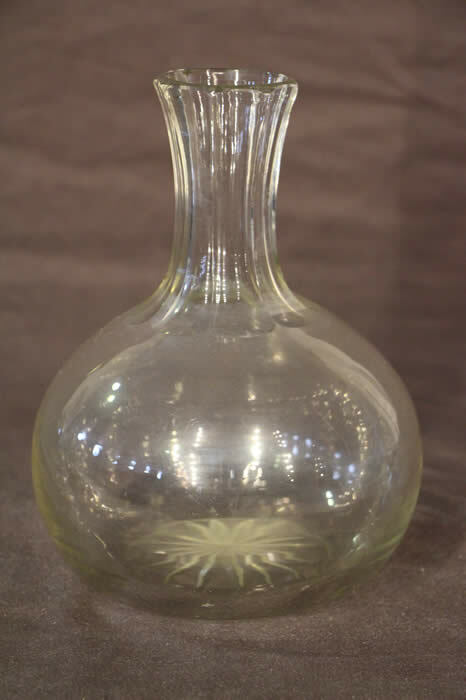 Entirely hand blown and of substantial weight. interior is cloudy but will clear with cleaning and fluid contents. 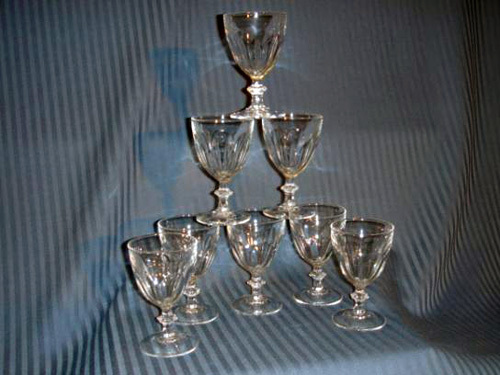 Set of Georgian cut glass wine goblets with bucket shaped bowl and knobbed stem. 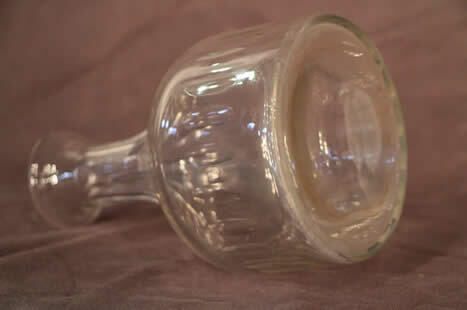 Raised on hand blown circular foot. 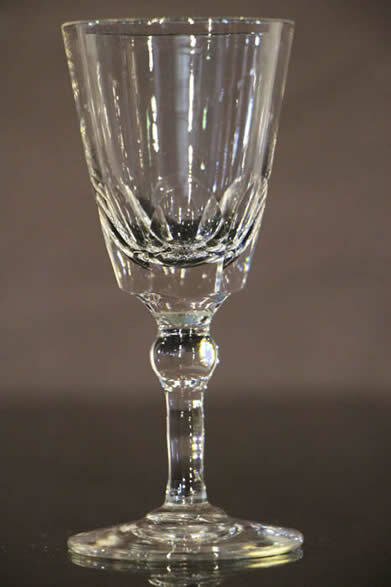 Note one glass has a flea bit to rim, which may be ground out but is very minor. 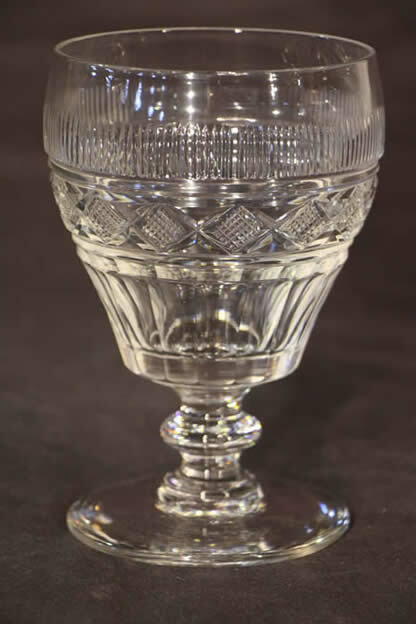 A substantial cut crystal Scottish style toasting goblet or chalice. 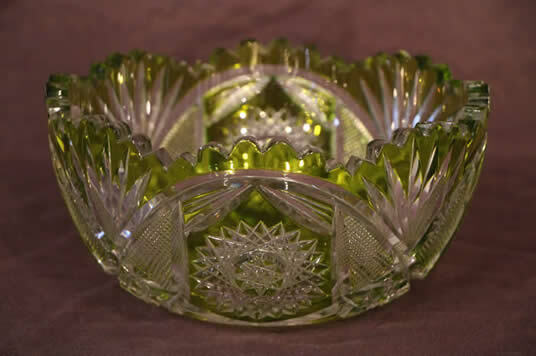 the Thissle shaped bowl with cut lozenge , fluted top and facetted base, raised on knobbed circular foot. 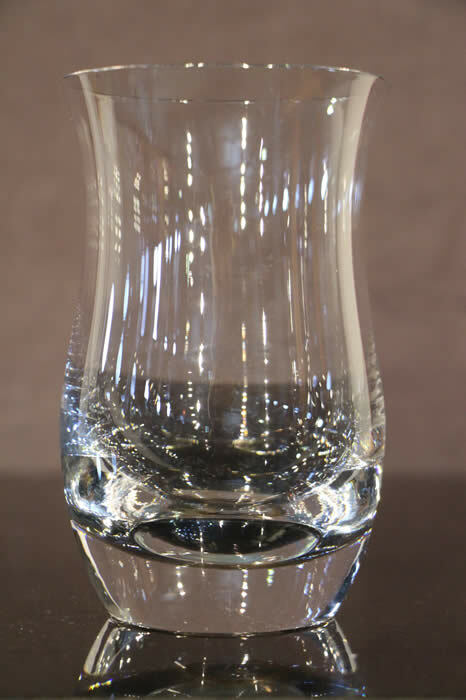 Pontil mark to base is a clear indication of this being hand blown. 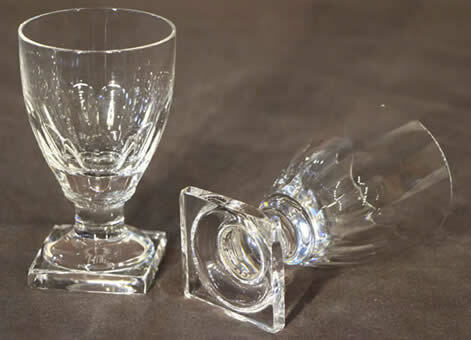 Set of two toasting goblets signed by William Yeoward, facette cut bowl raised on substantial square cut base. 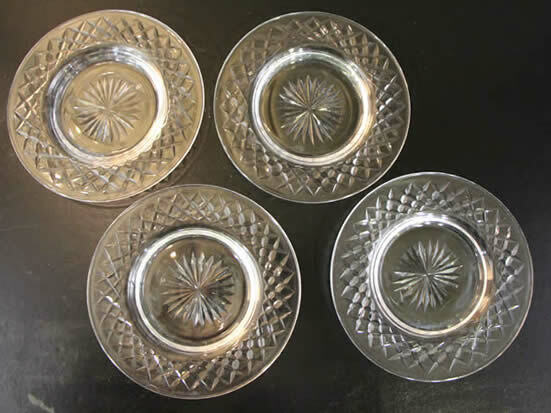 They are in the Georgian Rummer style with cut and facetted bowl and fine circular knobbed feet. 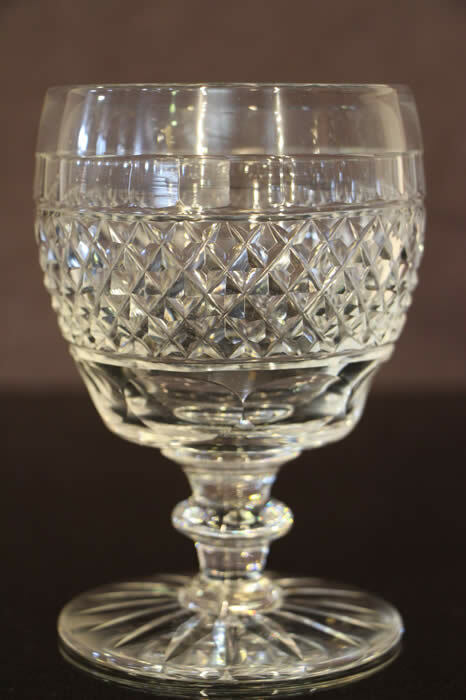 Gorgeous Heavy cut crystal vase similar to the harcourt design but with an earlier and rare roll over rim top . The balluster shaped body raised on knoobbed and facette cut base. 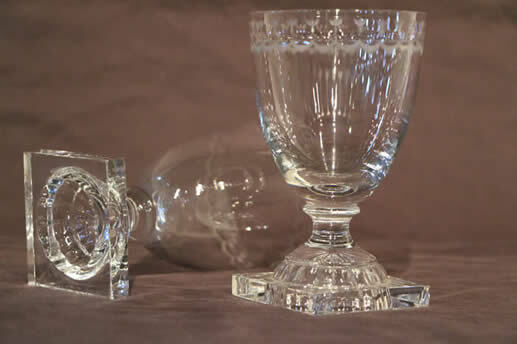 Very rare set of seven antique Austrian Biedermeier cut glass tumblers with 10 sided inverted tapering facettes ( top is wider than the bottom) all in very good order. 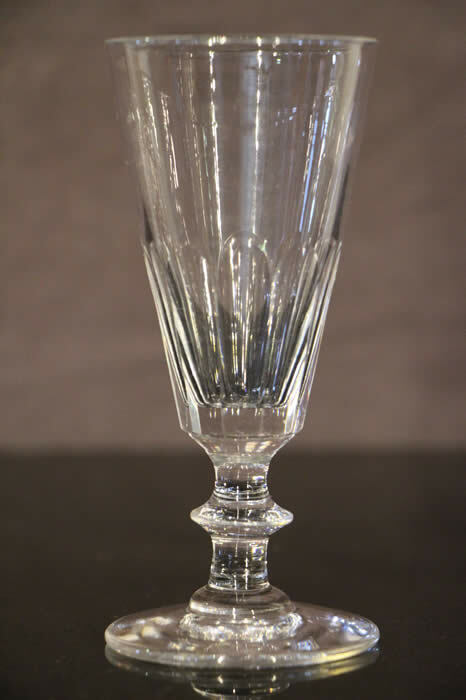 8 sided antique Vienesse engraved beaker with traces of gilding and lovely facetted sides. Late Biedermeier with later engraved M.A. initials. 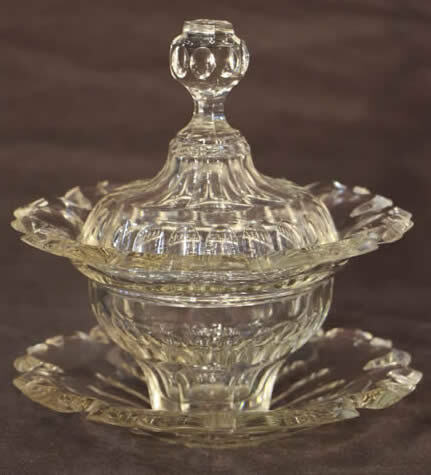 Georgian period flint glass lidded bon bon bowl 1780's, with heavy facette cut body and inverted swag edge with pineapple finial lid. 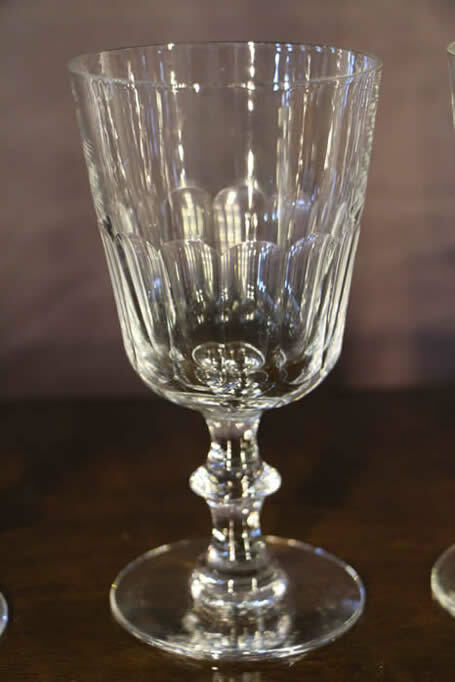 FRENCH CRYSTAL HARCOURT 1841 DESIGN STEMWARE. 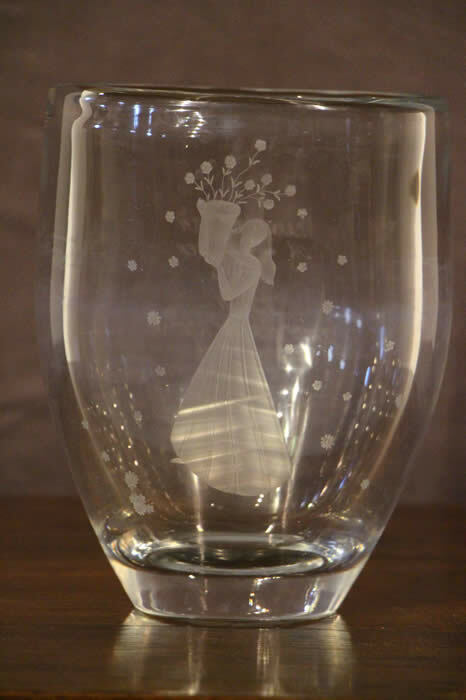 THIS IS IN MINT ESTATE CONDITION, ALL MARKED BACCARAT ON BOTTOM OF STEM. 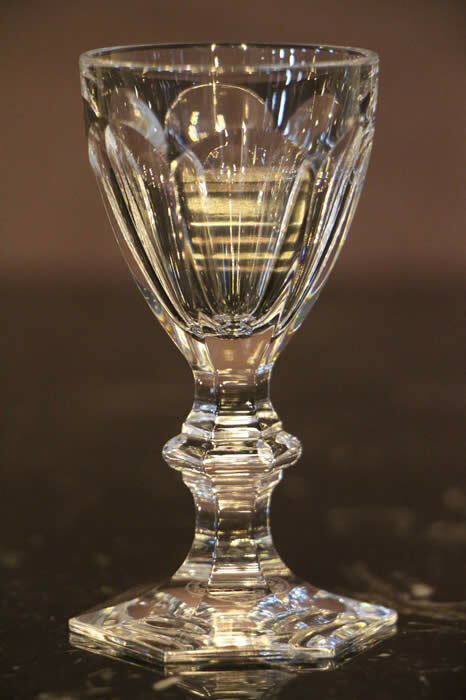 A VERY RARE NOT SEEN ON MARKET 3 3/4" CORDIAL/SHOT CRYSTAL GLASS WITH 2" DIAMETER TOP. 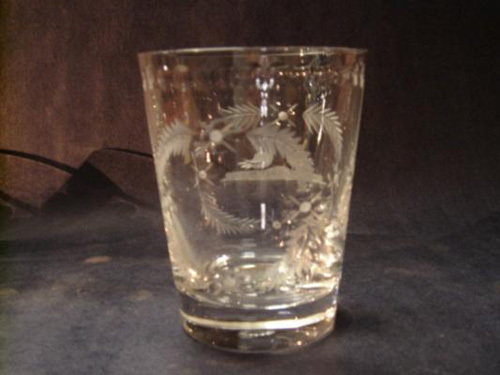 THIS CRYSTAL GLASS IS SCARCE , HARD TO FIND CORDIAL SHOT GLASSES IN MINT CONDITION, NO CRACKS, NO CHIPS NO REPAIRS. ALL ORIGINAL AUTHENTIC. 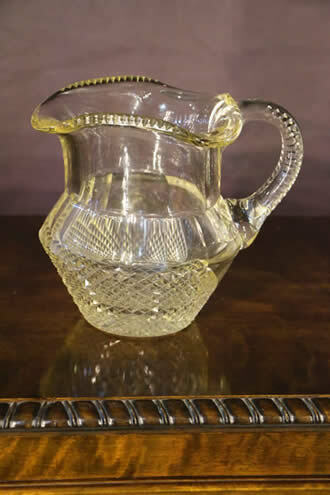 Large 19th century English Victorian cut glass wine carafe decanter with facetted neck and Lozenge cuts to body and flat broad base. 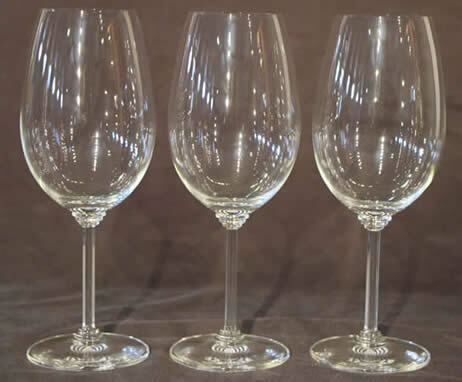 Similar types are refered to as Ships decanters as their body has the mass of the wine at the base for stability. 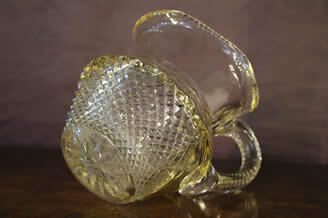 many of these "ships" decanters however never saw the rigours of the sea, it was just a practical design for stability. 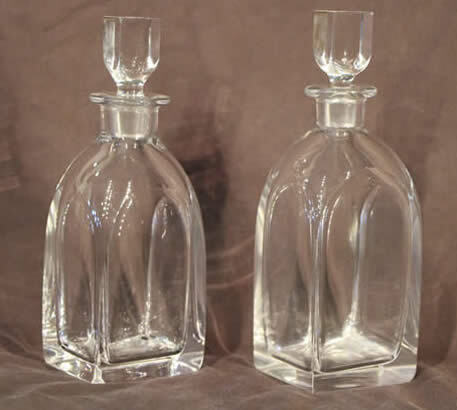 Large decanters such as these were also particularly used for wine. The surface area within the decanter allowed for airation and breathing of those heavier reds. This decanter will easily hold 3 pints plus. 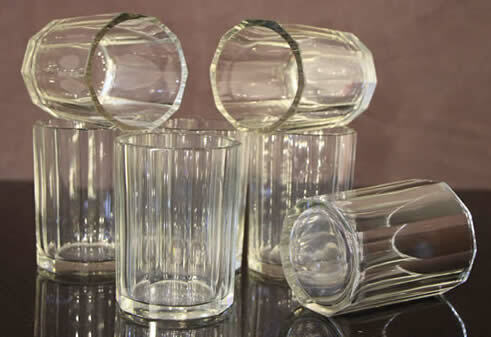 Good antique set of five matching hand blown cut glass whisky tumblers or vodka glasses in excellent condition. 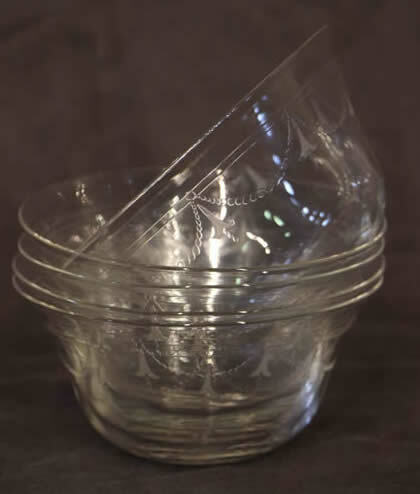 The facette ground tapering bowl with cross hatched banding to body, these Art Deco georgian inspired glasses are in perfect condition and age from early 20th century Scandinavia. 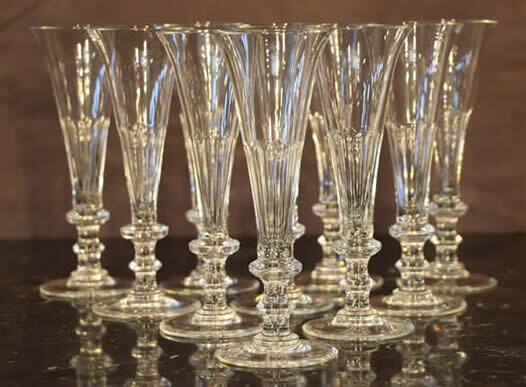 A rare set of ten peerfect cut crystal champagne flutes signed by the reknowned manufacturer of the worlds finest crystal: William Yeoward. Each flared bowl with cut faccetted stem and turned knob base. 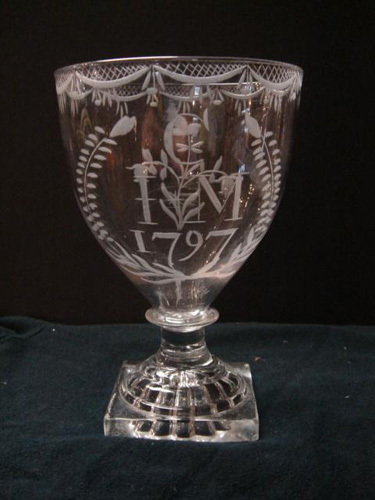 Engraved William Yeoward under base. 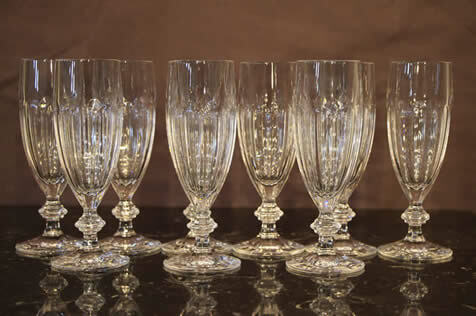 A very rare set of EIGHT cut crystal Bernadotte design Champagne flutes by Villeroy Boch. Each signed to the base and in very good order. Large proportion georgian style wine gobelts with superb engraved details and cut facetted stems. in the "Cordelia pattern" style by William Yeoward these fine crystal glasses are in perfect condition. 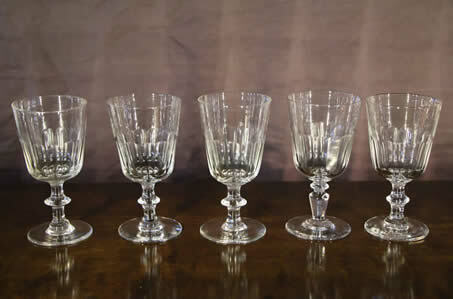 No signatures to base but certainly a set of impressive glasses of the finest quality..
Good collection of five various toasting glasses , consiting of a pair plus three individuals. 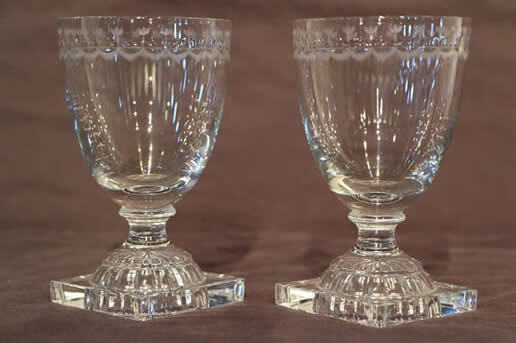 Pair of large William Yeoward crystal toasting goblets with superb engaving to upper lip. 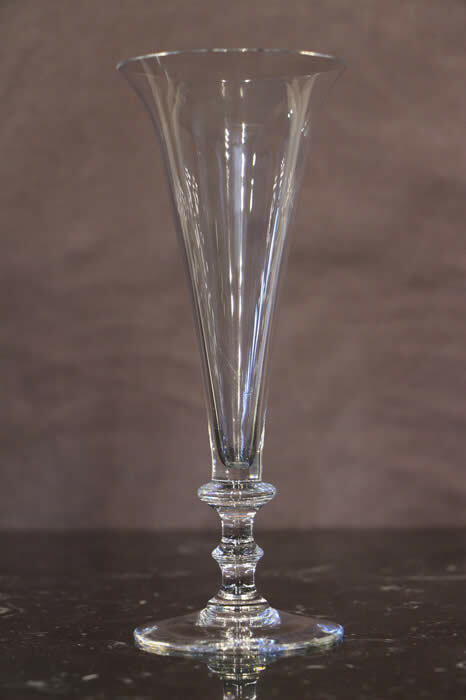 the turned knobbed stem supported by a traditional Georgian style "lemon squeezer" square pedestal base. Base signed William Yeoward, and in excellent condition. 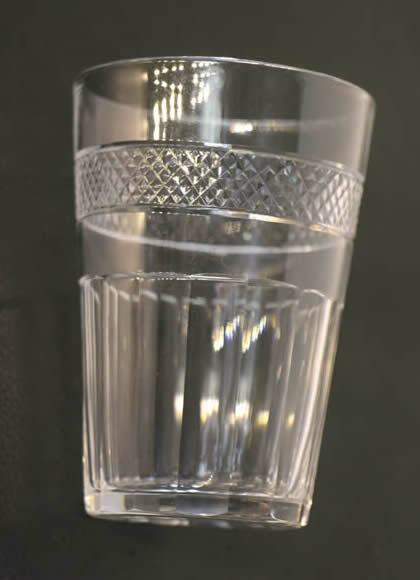 These types of glasses usualy sell for around $600 each. 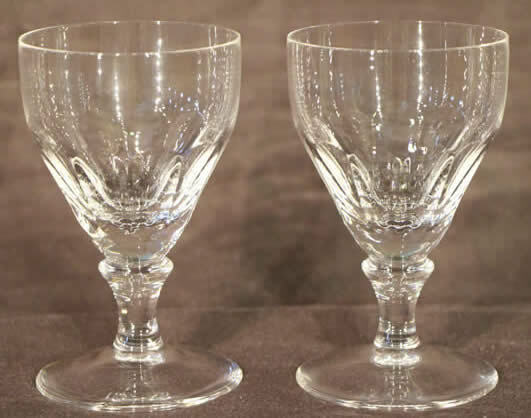 Title Pair of William Yeoward Crustal Red wine goblets of balluster shape. 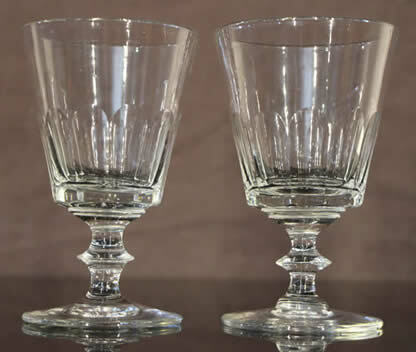 Pair of very high quality crystal red wine toasting goblets or rummers in the Georgian manner. in excellent condition they are signed William Yeoward to base . 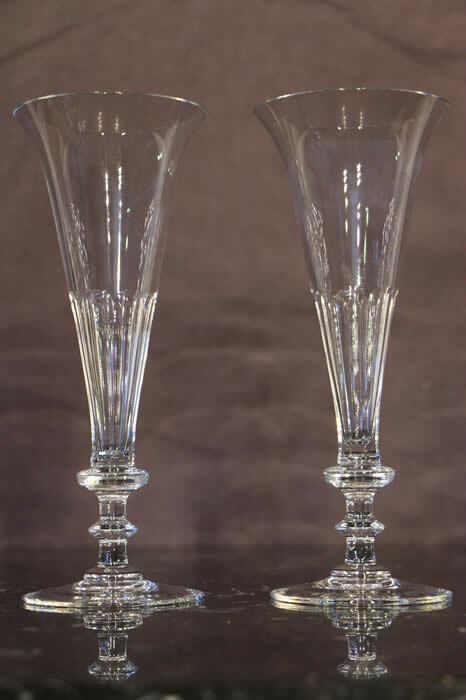 A pair of perfect cut crystal candlesticks signed by the reknowned manufacturer of the worlds finest crystal: William Yeoward. 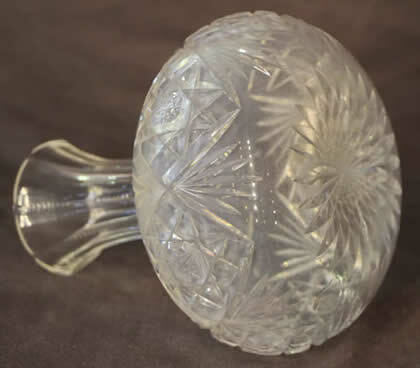 Each with bulbous stem with cut crystal nozzle and turned knob base. 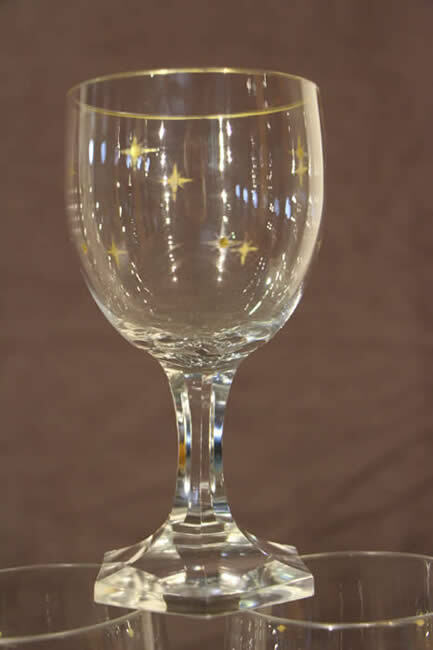 Star cut base engraved William Yeoward under edge. 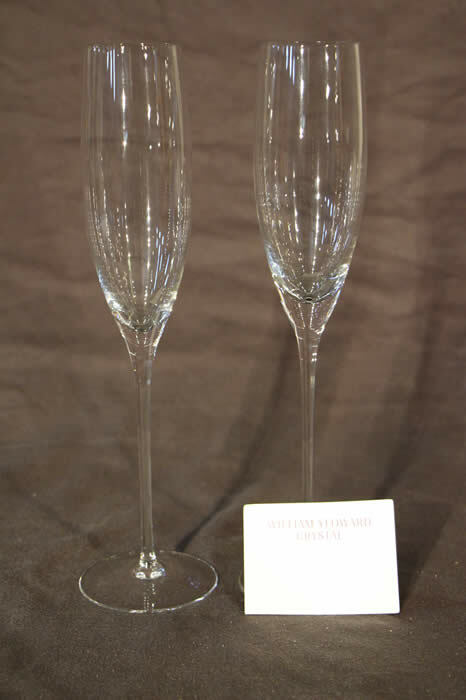 Pair of Champagne flutes by the noted William Yeoward. 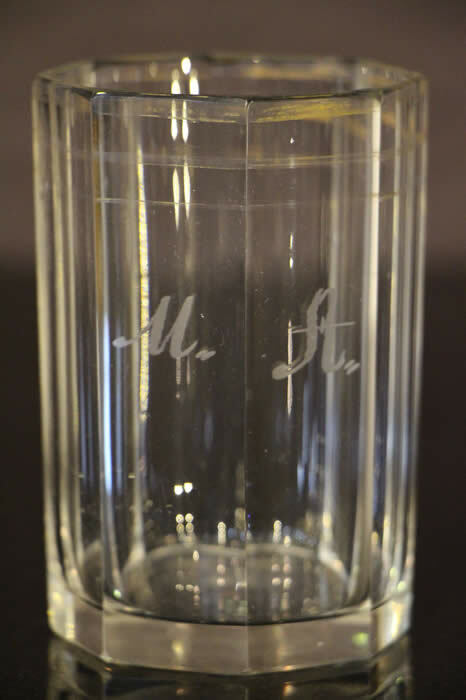 Tall elegant body with signature to base, these two toasting goblets signed by William Yeoward,would make an ideal wedding gift. 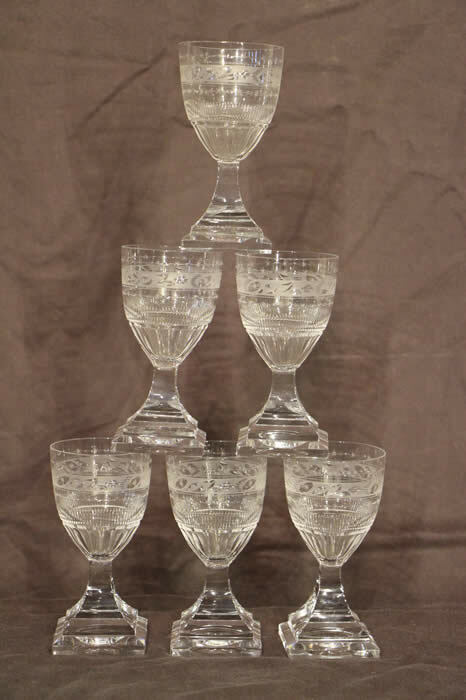 Set of 8 heavy Baccarat style cut crystal glasses, 20th century, priced as set of 8. 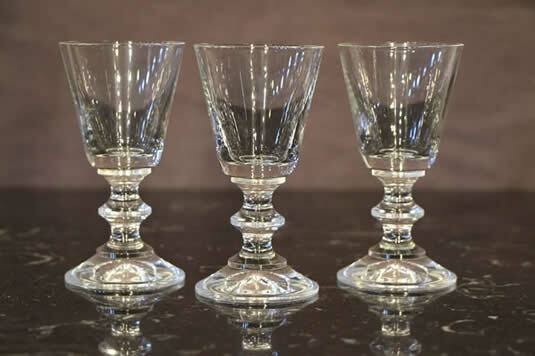 Three French Empire style crystal liquer or shot glasses , unsigned in perfect condition. 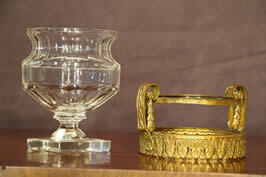 Traditional early 19th century shaped inverted bucket bowl and knobbed stem. 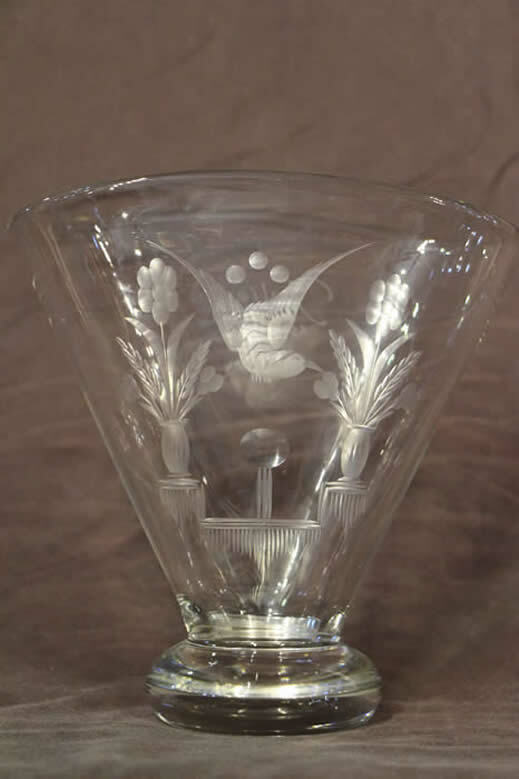 Title gorgeous traditional Peiking Glass Paperweight with twin parrots, a "token of love"
Set of two large toasting champagne flutes signed by William Yeoward. 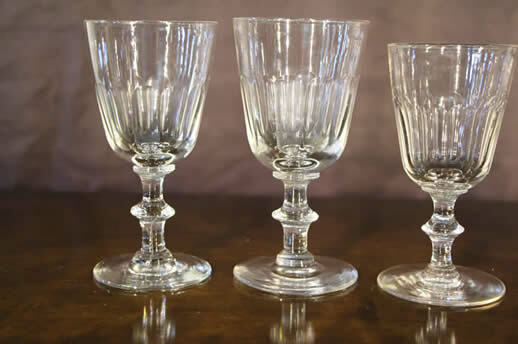 In perfect condition, these gorgeous glasses are made of the finest cut crystal in the elegant georgian manner with cut and facetted bowl and fine circular knobbed feet. 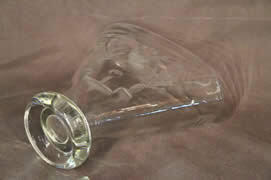 A large toasting champagne flute signed by William Yeoward. 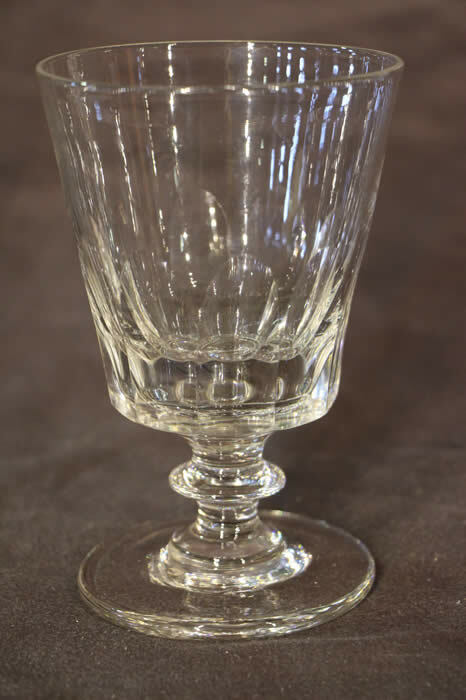 In perfect condition, these gorgeous glasses are made of the finest crystal in the elegant Georgian manner with turned hand blown crystal bowl and fine circular knobbed feet. 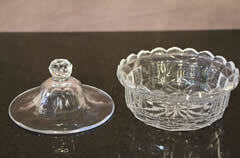 Heavy Cut Crystal facetted bowl with hand cut ornatmentation and crimped edge to bowl. 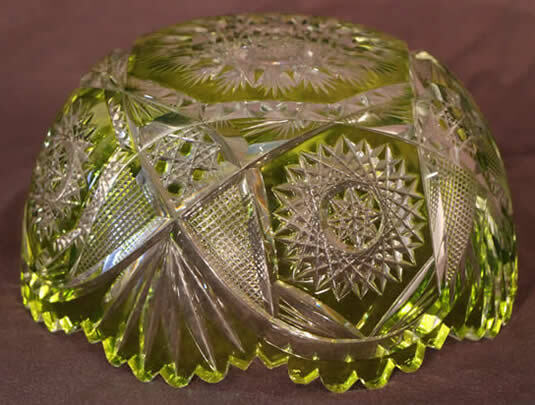 A beautiful pale "uranium green" flash over glass applied prior to hand cut and engraved design. 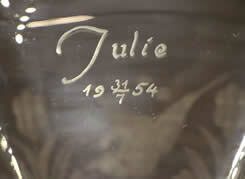 No signatures or makers marks , which is not unusual for this type of ornament and age, but in very good condition . 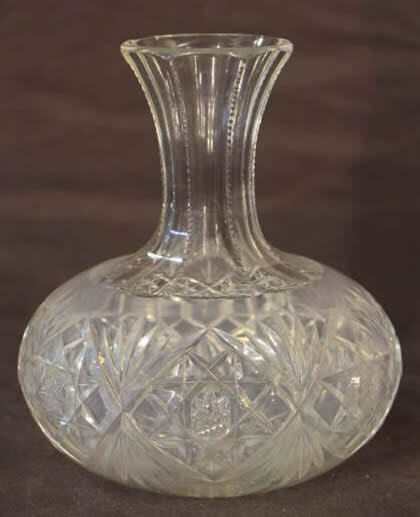 Ideal as a centrepiece or flower vase of the Louis XVI style, complete with embossed swags and raised on facette cut square base cyrstal pedestal . the metal onrmanetation lifts off for easy cleaning. 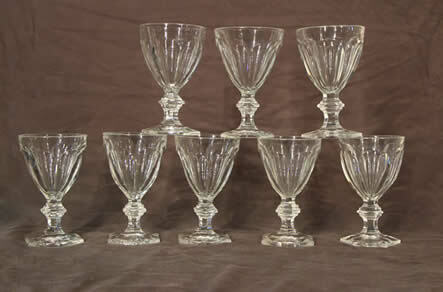 Good large set of twelve cut crystal brandy balloons or spirit glasses. 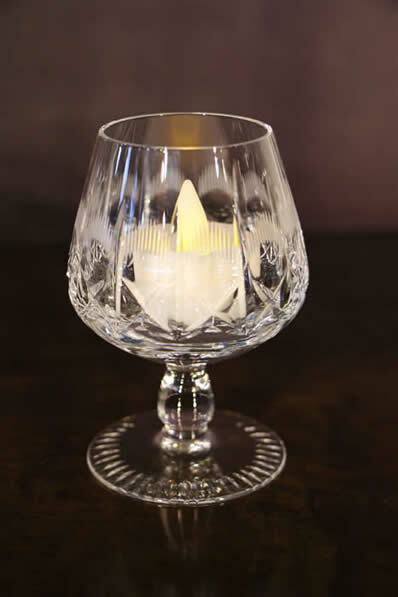 The shape and size is also perfect for tea lights or candles, for the romantic dining table . In excellent condition . 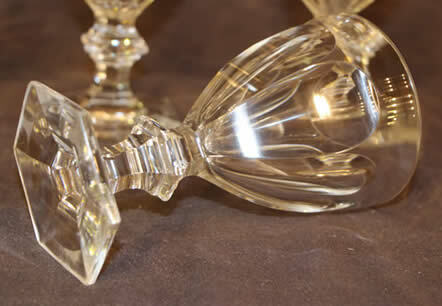 Pair of Swedish Orrefors crystal decanters with original stoppers. 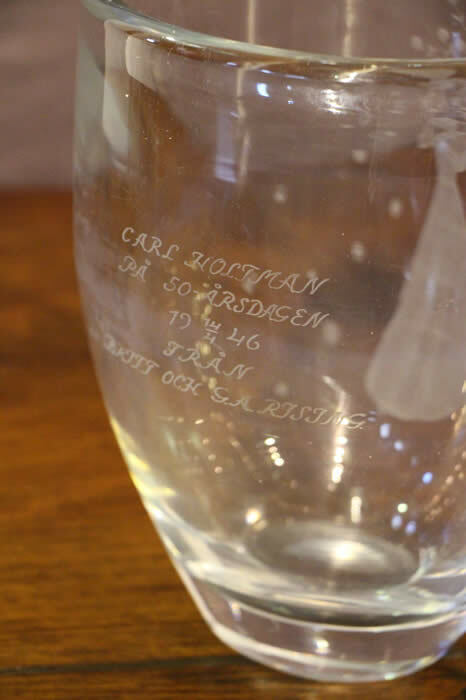 Signed and numbered, these heavy crystal decanters with square top stoppers have a date numbering system that was adopted by Orrefors in 1935. Double initials are first used bewteen 1926-1934 but were continued at a later time. The initials EH may have stood for the noted artist Edvard Hald (1883-1980), whilst the number system indicates a 1941 design . 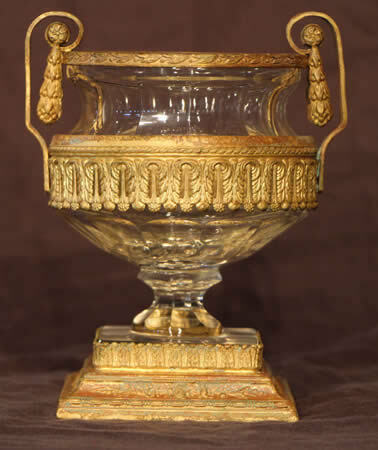 Crystal facetted cut vase of the Georgian manner with gilt ormolu ornamentation to top and base. 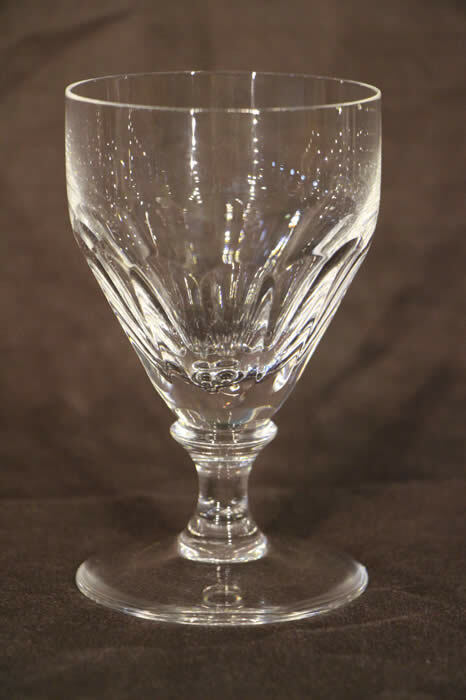 Ideal as a centrepiece or flower vase of the Louis XVI style, complete with embossed swags and acanthus borders.